Much of Tamriel's history is known and documented, but large swathes are still unknown, particularly the periods known as the Dawn Era and the Merethic Era. 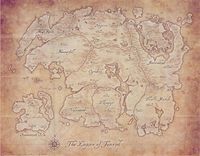 Tamriel's very beginning can be traced to the War of the Ehlnofey, when the wandering Ehlnofey fought the Ehlnofey who remained settled in their former home. During this war the original singular landmass of Nirn was broken apart into at least four major landmasses—Tamriel, Akavir, Atmora, and Yokuda. The wandering Ehlnofey were ancestors to all men, while the settled Ehlnofey were co-ancestors with the Aldmer to all mer. It was at the end of the Dawn Era that the Aldmer of Aldmeris began to diverge along cultural and biological lines, starting the process that would lead to the modern mer races. In the middle of the Merethic Era an unknown threat caused the Aldmeri to leave Aldmeris and head towards Tamriel. They colonized many islands along its coast before settling on Summerset Isle. Later they started moving inland, settling many areas in southwest and central Tamriel. Wherever the Aldmer settled they displaced the primitive beastfolk (the ancestors of today's Argonians, etc.). During this time the Ayleids built White-Gold Tower and eight lesser towers around it. Through powerful machinations and the position as the 'spoke' of the wheel within the lesser towers, White-Gold Tower became a very powerful tool—it is said that the tower is what stops Mundus falling back into Oblivion. In the late Merethic Era men begin to appear on Tamriel. This is not strictly true, as many races of men—such as the feathered men that Topal the Pilot encountered, or a human race in Morrowind—already resided on Tamriel. Instead this time is taken as the period when the men of Atmora came in force to occupy and settle whole-scale on Tamriel. These Atmorans were the ancestors of the Nords. While many of the original races of men died out, many of them interbred enough to became one race known as the Imperials. The conquering of northern Tamriel was sparked by the decline of Atmora and its eventual loss to a catastrophic change of climate from one that supported life to one of 'permanent winter' where no life could survive for long. The Dragon War at the end of the Merethic Era ended the reign of the Dragons. In the third century of the First Era the Alessian Slave Rebellion saw the humans of Cyrodiil overthrow their slavers, the Ayleids, marking the point at which humans began to dominate Tamrielic history. St. Alessia made a covenant with Akatosh to create the Amulet of Kings. The covenant stated that so long as one of Alessia's heirs wore the amulet, the realms of Oblivion would be cut off from Nirn. Near the end of the seventh century, in 1E 668, Red Mountain erupted for the first time in recorded history. 32 years later the Battle of Red Mountain occurred, in which the Chimer fought the Dwemer on Vvardenfell. The end of the war came when all Dwemer simply vanished from Tamriel, leaving behind their many artifacts and strongholds. After the war the Tribunal took over Morrowind, and shortly after that the Chimer were changed into the Dunmer. The continent of Yokuda sank in 1E 792, so its peoples, the Yokudans emigrated to the area now known as Hammerfell. The nature of the disaster is unknown but many natives think it was self-inflicted. The Yokudans, after conquering Hammerfell, took on many of the customs of the Aylieds, and after many centuries in the harsh desert conditions evolved into modern day Redguards. In 1E 2200 the Thrassian Plague claimed the lives of more than half of Tamriel's population. The losses were concentrated to the west and south. The plague was particularly hard on the Khajiit of Elsweyr. From sixteen harmonious kingdoms and twenty different types of Khajiit, the plague left them with catpower to form only two kingdoms. The often vastly different outlooks from the various kingdoms all shoved together led to conflict. In response to the Plague the All-Flags Navy was formed to exact revenge on the Sload. This was the first time all nations on Tamriel had worked together and it would have profound implications that would last for eras. In 1E 2703 the Tsaesci from Akavir invaded Tamriel. Skyrim and Cyrodiil united to defeat them. The leader of the armies, Reman, went on to found the Second Empire, which brought all the nations of Tamriel, except Morrowind, under the Empire's control as provinces until 2E 430. In 2E 560 the Knahaten Flu spread from Black Marsh through the lower provinces and then into the other provinces killing many people. Argonians were immune to the disease, leading to speculation they were responsible, but this proved to be incorrect. While the disease killed almost all non-Argonians in Black Marsh it was not as devastating elsewhere, though it did wipe out entire cities, religions, and cultures. The Knahaten Flu had a big impact on events of the next three decades. The Altmer gave aid to the suffering Khajiit, who out of gratitude joined the Aldmeri Dominion. The ruling family of Wayrest was wiped out, leading to Emeric becoming king. Emeric spent the next fifteen years expanding the newly signed Daggerfall Covenant to include High Rock's neighbors in Hammerfell and Orsinium. The Argonians then banded together, as an equal partner, with the Nords and Dunmer in the Ebonheart Pact, to protect their interests against the other two alliances. In 2E 582 the Alliance War broke out. Tensions had been simmering between the three alliances and the Empire of Cyrodiil, but the Soulburst and the Planemeld threw them into open conflict to try and gain control of the Ruby Throne and save Nirn from Molag Bal. Molag Bal's plan was foiled but the outcome of the war for the throne is unknown. From 2E 852 to 854 a series of wars led by Cuhlecain and Tiber Septim led to the formation of the Third Empire under Tiber's rule. In 2E 896 Tiber conquered the Summerset Isles and for the first time all the provinces of Tamriel were united under one banner. The significance of the event lead Tiber to declare a new era. In 3E 433 the Oblivion Crisis occurred. Due to a lack of Alessian heirs to wear the Amulet of Kings, the Dragonfires died out. Mehrunes Dagon attempted to invade Tamriel, destroying Kvatch and the Crystal Tower. The Crisis ended when an illegitimate heir sacrificed himself to call Akatosh and defeat Dagon. It was claimed that Nirn could not ever be invaded again by daedra from Oblivion. When the Crisis was over a new era was announced, making the Third Era the shortest complete era to date. At the start of the Fourth Era Red Mountain erupted again. This time it destroyed the entire island and devastated the rest of Morrowind. The Argonians then invaded and unleashed their anger at centuries of oppression and slavery on the survivors, only being stopped on the banks of the Scathing Bay. During the early Fourth Era the Empire started to crumble and then in 4E 40 Umbriel, a floating island from Oblivion appeared. The island made its way over Black Marsh to Morrowind, before turning and heading straight for the White-Gold Tower, causing massive devastation along the way. The island was summoned by a rogue Hist tree to kill all non-native Argonians, but quickly went its own way after appearing. The island was eventually stopped by the efforts of Prince Attrebus Mede and his soon-to-be wife, Annaïg Hoïnart. It disappeared leaving behind hordes of corpses by the walls of the Imperial City. From 4E 171 to 175 the Great War between the Thalmor and the remainder of the Empire raged across Tamriel. The Thalmor leaders of the third Aldmeri Dominion, believed that mer should rule the continent, while the men who currently occupy the throne think different. The terms of the current peace treaty drove Hammerfell to abandon the Empire, and a civil war broke out in Skyrim—the result of which will determine if Skyrim will also secede. There are nine distinct provinces, each home to one of the more populous races of Tamriel. A proposed tenth province, Orsinium, has never been taken very seriously except by those who want it, namely the Orcs, who wish to have a home province of their own. This page was last modified on 9 November 2018, at 14:25.